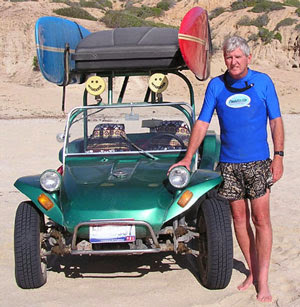 I've been surfing since 1949 and for the last five years I've been spending my winters surfing in Baja. At 68 years old, paddling out is really a chore. I find at my age keeping my head up while prone paddling has become very difficult. When I saw the ad for PaddleAir in Long Board magazine I knew I had to try one. Let me tell you, PaddleAir works great for me. It's easy to adjust the air, I use more air for a long paddle out and just a little for catching waves. No more sore back, ribs or neck. I would highly recommend PaddleAir for anyone who wants to make paddling easier.